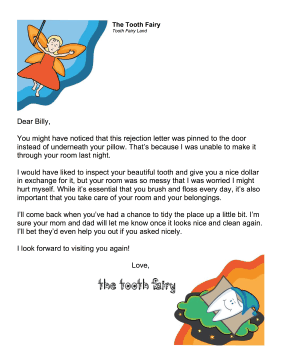 Get a child to clean their room by withholding the Tooth Fairy's reward and providing a light scolding instead. You might have noticed that this rejection letter was pinned to the door instead of underneath your pillow. That's because I was unable to make it through your room last night. I would have liked to inspect your beautiful tooth and give you a nice dollar in exchange for it, but your room was so messy that I was worried I might hurt myself. While it's essential that you brush and floss every day, it's also important that you take care of your room and your belongings. I'll come back when you've had a chance to tidy the place up a little bit. I'm sure your mom and dad will let me know once it looks nice and clean again. I'll bet they'd even help you out if you asked nicely.